Prayers such as “God, what am I supposed to major in?” or “Where do You want me to live next year?” were commonplace. My hope was to get clear answers from God… “International studies and the dorms, Becky.” Sure, there might be two or three alternatives that were “ok” choices that God could use even though they weren’t the “right” choice, but most decisions I could make boiled down to being “wrong” choices – if they weren’t God’s perfect will, then they weren’t good enough. And if I made one wrong – or even less than perfect – choice, that would then affect each choice I made down the road. How would I get the “right” job if I pick the “wrong” major? I would have to start at the beginning of the maze again! I took Isaiah 30:21 quite literally. “Whether you turn to the right or to the left, your ears will hear a voice behind you, saying, ‘This is the way; walk in it.’” Why was I not hearing that voice? Had I already made a wrong decision that got me off the path? 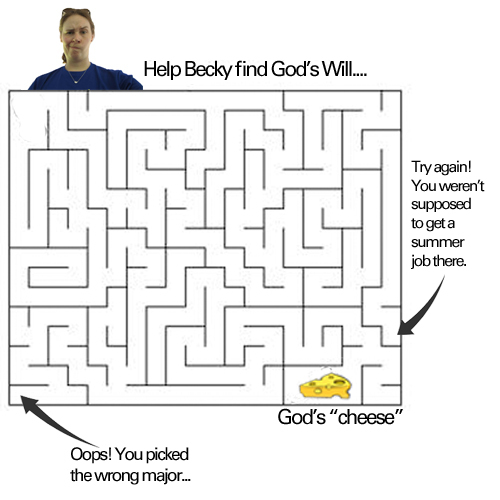 But as I grew in my faith and talked to mentors in my life, I learned that “seeking God’s will” was actually much more complicated than that and that it was not about making one right choice at each fork in the road. In fact, I began to realize that if I was seeking God in my life and truly making decisions that helped me live into my part of the greater body that Paul writes about in 1 Corinthians 12, I could not make a wrong decision. It was like when I used to cheat at the mazes (you know – the ones on the place mats when you were a kid), working backwards from the end! (If you don’t know, that makes maze-solving a much simpler task). My new paradigm starts with Christ. Seek God first and then each decision along the way becomes just that – a decision. I read the passage from Isaiah in a new light. I can go left or right and either way, God is with me, encouraging me to stay on his wide path. I love food. That might be why I am blogging about it. I read down in Sherm’s blog about prayer and how our minds have a tendency to wander. I catch my mind wandering down to the Ave and stuffing my face with a jumbo beef and lamb gyro from Aladdin’s. Or maybe it’s a hot plate of Pad Kee Mao from Thai 65. Whatever the flavor of the week may be, it is hot on the mind (if you couldn’t already tell). This might also be the reason why I think the comedian Jim Gaffigan is so funny. If you like stand-up and you haven’t seen his set about food, I suggest you watch it now. I have him to thank for recognizing the versatility of the ham sandwich. Without saying more it is a strong use of 45 minutes of your time. While food is on the mind, it’s the process of eating that I really want to talk about. We can use eating as a metaphor to help understand faith also. When we eat we taste food, chew on it, process it as it becomes useful for our bodies. Likewise, we can do the same “eating” in our faith journeys. This “eating” is a commitment to knowing Jesus Christ more. Eugene Peterson encourages us to “eat the word of God”. He pushes us to taste it (study it), chew on it (meditate on it), and process it (apply it to daily life). Even Jeremiah (in chapter 15) says “When your words came, I ate them.” It sounds so wonderful in theory! I think we all might agree that it isn’t so simple in real life. One step we can take is learning how to “eat” better. We also have to make sure we are eating the right stuff. Sometimes we wonder if the celebrities that are endorsing food or drinks actually partake it what they sell. Does Brett Favre really wear Wrangler jeans? Does Ricky Bobby really chew big red gum? Does Donovan McNabb really enjoy Campbell’s soup? I don’t know. Are these celebrities “eating” what they are selling? I wonder the same for us in our representation of the Christian faith. Are we really eating what we are selling? When we proclaim that we are Jesus Christ followers do our lives and minds represent a real authentic Jesus? This might be a serious reason why people think Christians are a hypocritical bunch. We don’t eat what we sell. My encouragement and challenge is to take time to think about how you “eat” your faith. You might discover new foods to eat, new ways to eat and, most importantly, great ways to share it.